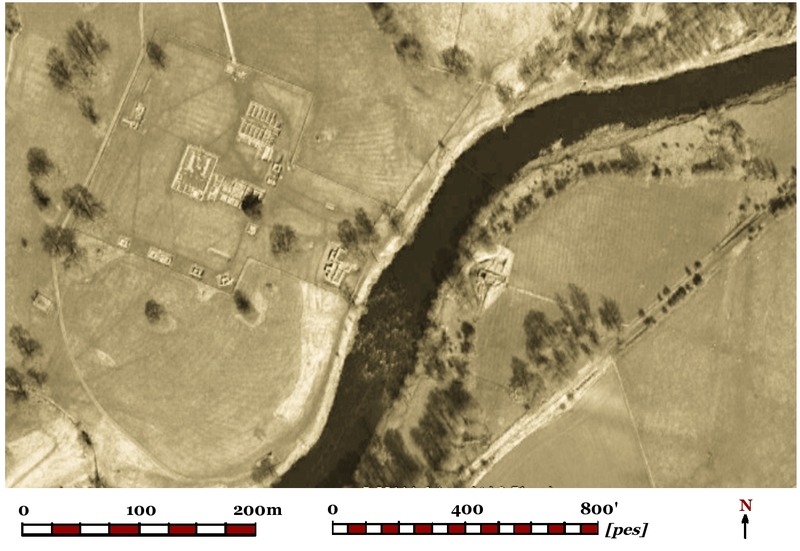 Previously, I have discussed the evidence for a temporary timber and earth rampart with associated infrastructure which necessarily predated and facilitated the construction of Hadrian’s Wall in stone, it follows that there was probably a temporary bridge where it crossed the North Tyne at Chollerford, [Chesters]. In addition, unlike a timber bridge built on piles, the construction of a Stone bridge also requires significant temporary works, which are evident from the air. A second and more massive phase, thought to date from the refurbishment around 160 AD, built to carry both the Wall and the Military Way. The evidence from the bridge abutment prompts the question where was road bridge in the initial for plan Hadrian’s Wall? 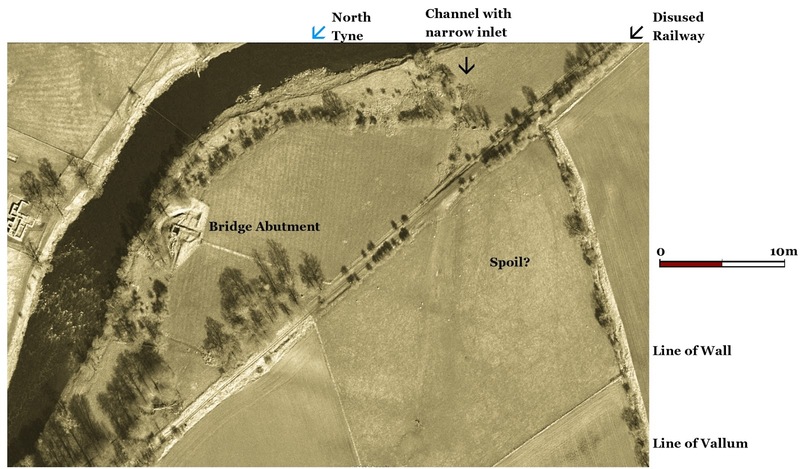 In addition, it might be presumed there was an initial timber phase of bridge to carry the Military Way, not to mention some form of barrier across the river corresponding to the temporary wall. These defencive works would necessarily be to the north of the Bridge Abutment, while the temporary bridge was perhaps between the between the Wall and the Vallum. Another factor would have been any existing bridges in the area, it is presumed that earlier East – West Stanegate road crossed the North Tyne a little further downstream. 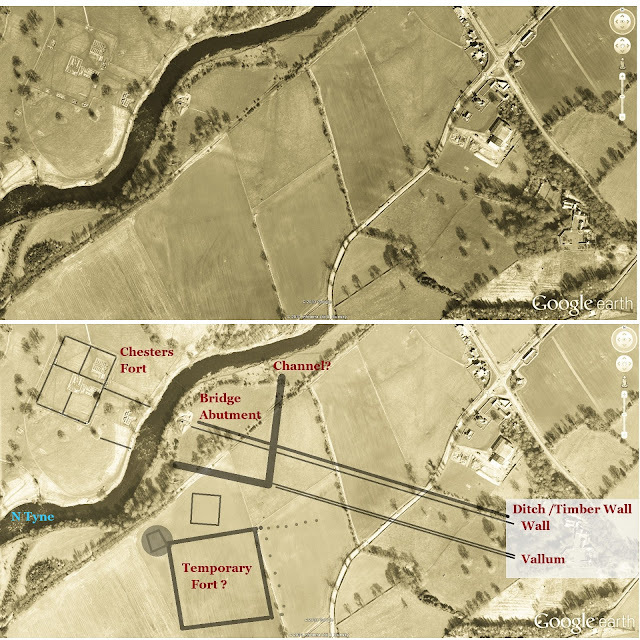 Chesters Fort is a well preserved stone cavalry fort on the West bank, which overlies the foundations of an original Wall turret, and in this form, represents one of the forts that were added to the Wall. As previously noted, those engaged in the construction and garrisoning the Wall in its initials phases of construction would require secure accommodation. 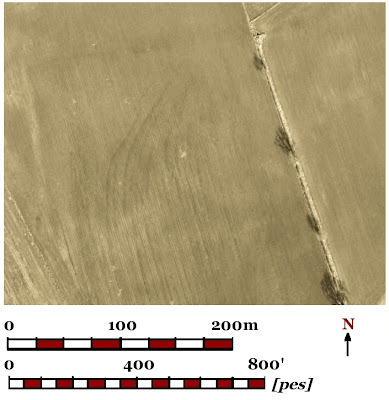 There is a large crop mark which may be such a temporary fort, [above], with other marks around it, to the south of the Bridge Abutment. There may have been similar arrangements on the West bank, certainly during the construction of the fort, but perhaps earlier a military presence on both sides of the bridge may have been considered prudent. In order to build bridge carried on stone piers in the river, presumably the water level in the vicinity of these works had to be lowered to facilitate construction. While it is clear that Cofferdams were being used by the early second century, it seems less likely that this technology would be used by an army in the field on the northern frontier, rather than the technologically simpler method of diverting the river. Caesar used a similar method to lower the river Segre, Lerida [Spain] to allow his troops to ford it, when there was no timber to build a bridge. The spoil appears to be thrown to East and South. The regular island created by this channel is of sufficient size to accommodate a small fort at the eastern end of the bridge works. Since the feature’s East West leg follows the presumed line of Vallum, which was abandoned when work resumed following the dislocation, it was presumably dug in this or a later period. It is also appears to be crossed by the line of the wall, suggesting it dates from early in the construction sequence. The construction of the Bridge at Chollerford, like the other more technical aspects of the stonework, would have prioritised for gangs of specialists,  and might be expected that work would be underway by the time of the Dislocation, when work on the wall was disrupted, having reached this area. 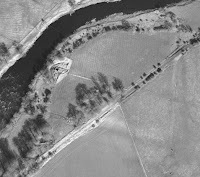 Since the earliest stone bridge at the existing abutment is only wide enough to carry the Wall, it adds to the argument that the main road crossing was intended to be where the ‘Vallum’ crossed the river. In any event, while the possible channel is perfectly placed to service the Wall crossing and the later enlarged Wall/road crossing represented by the surviving abutment, it cuts the presumed line of the Vallum, so could not be related to the construction of any bridge planned here. 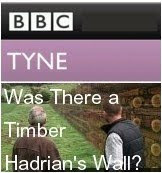 The principle random factor in an understanding of the engineering of Hadrian’s Wall is the Dislocation, which left work suspended and then prompted many changes in the scheme; thus, it is possible that this work had started before, and was completed after the dislocation. While there should be extensive temporary works which have yet to be properly defined, the exact position of any early bridge is one of the more important missing pieces of Hadrian’s Wall at Chollerford. [Opt cit.] Chapter 10 and Breeze, D.J. 2003. 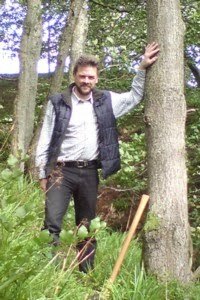 "Warfare in Britain and the Building of Hadrian's Wall." Archaeologia Aeliana 32, 13 –16. It's my pleasure - thank you for reading.